After reading John McCutchan’s recent post on numeric computation in Dart, and a conversation with Srdjan Mitrovic from the Dart VM team, I made some changes to the Dart port of Box2D in the hope of improving performance. The specific commits that make up this change are here and here, and this change has been released to pub as version 0.1.6. Originally, I had attempted to port the internal math library to John’s vector_math library. For one, this would mean that I no longer need to maintain a chunk of code, and for another it means any work he does to introduce SIMD into the library will automatically be available to me. However, this integration introduced some major instabilities into one of the collision solvers so I abandoned it. Instead, I made two key changes to the code: Converted all num types to double, and converted the vector and matrix types to use typed data instead of double stored in fields. First, the results. 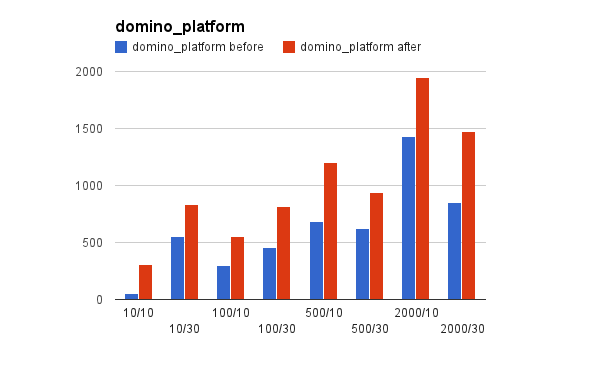 All benchmark code can be found here and were run under SDK version 0.5.11.1_r23200. 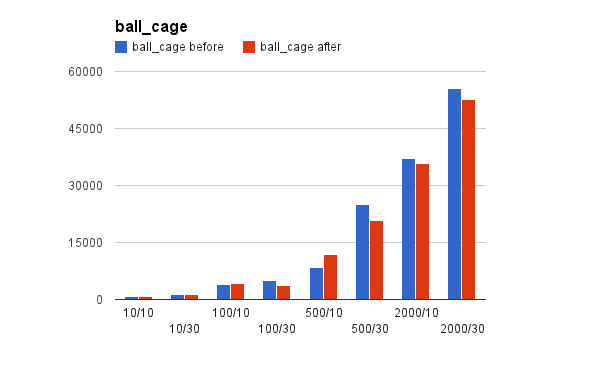 In all the below charts, the y-axis is the number of steps simulated per second, hence bigger is better. This simple benchmark shows little difference in performance across the board. 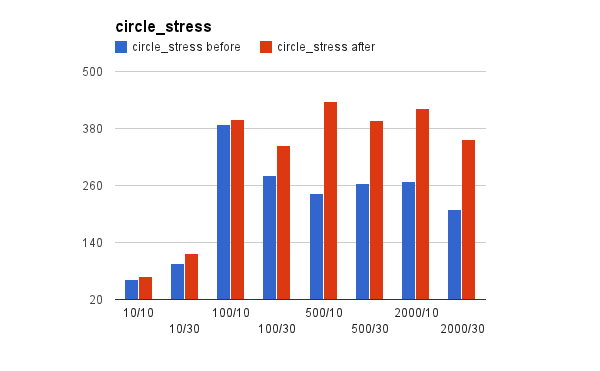 This simple benchmark shows a performance regression for higher step counts. This may be a sign that some parts of the code haven’t been updated to use doubles so the VM is having to do extra work. 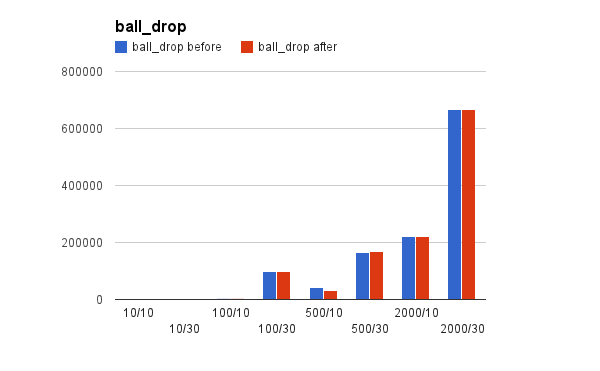 The first of the complex benchmarks with many collisions per frame shows a huge improvement across the board. The performance was always fairly consistent, but now it is consistently better. The most complex benchmark (the one that exhibits the collision instabilities under vector_math) also shows huge improvement in performance. It is clear from the above results that these changes have made a significant positive difference to performance, but why? We’ll tackle each part of the change in turn. The VM can work with doubles in an unboxed form which makes computations very efficient. This does, however, break down when passing doubles to functions or returning them from methods as this causes a box/unbox operation pair. Similarly, storing a non-smi number in a field, as the old math library was doing, causes a box operation as fields can only hold smi values or object pointers. And that’s where typed lists come in. Typed lists in Dart can only hold numbers, not regular objects. Further, unlike when working with integers, the double value does not need to be tagged. This means that the storing and retrieving doubles from a typed list is very fast, and also very memory efficient. If you’re doing any kind of numeric computation in Dart, read John’s article again and follow his advice. The tips he gives are not theoretical; they have a significant practical performance impact. This entry was posted in performance, web and tagged box2d, dart, dart vm, dartbox2d, performance. Bookmark the permalink.